Short description of framework: A framework illustrating how value is created and captured by an organization through the decisions made and the resulting consequences, illustrated in causal loops. Main strengths: The framework captures what an organization is trying to do, key values the management wants to create, and the incentives for suppliers, partners, and customers. It also illustrates if management is stringent in its decisions and if different choices results in consequences that reinforce each other or not. 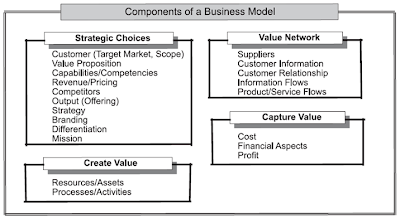 Casadesus-Masanell and Ricart based their framework on the four major categories common to most business model definitions uncovered by Shafer, Smith and Linder in their article The Power of Business Models, from 2005. 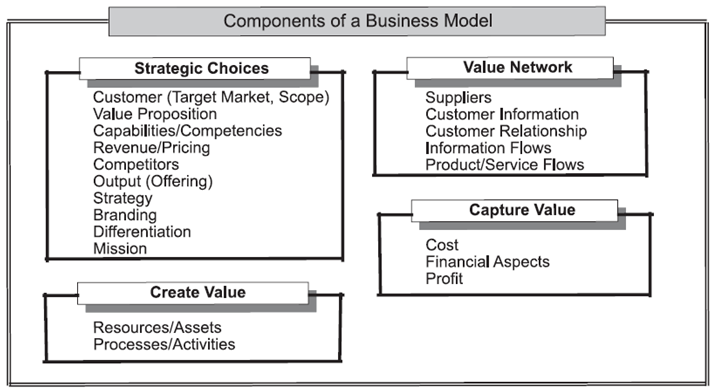 Casadesus-Masanell and Ricart argue that “consistent with the intuitive view of the concept, a business model is defined by strategic choices, sometimes made by a network of organizations, that explain value creation and value capture by the focal organization” and conclude that one important component of business models are the concrete choices made by management. 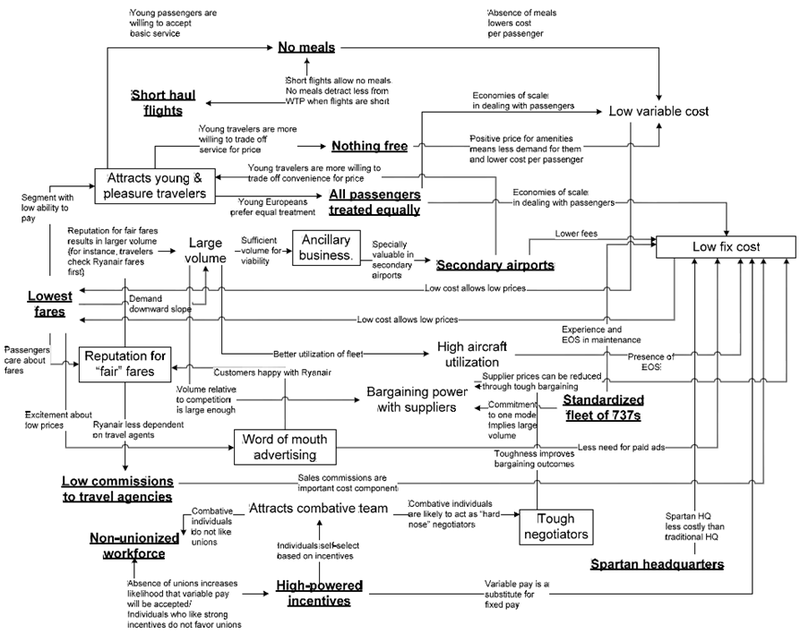 To connect the choices to value creation and value capture, Casadesus-Masanell and Ricard include consequences in their definition of a business model. Casadesus-Masanell and Ricart define the business model as (i) the set choices and (ii) the set of consequences derirved from those choices. They distinguish between three different types of choices: policies, assets, and governance. Consequences are classified into flexible and rigid. Assets (Choices) Choices regarding tangible resources such as manufacturing facilities. Governance (Choices) Choices regarding the structure of contractual arrangements that confer decision rights regarding policies or assets. Rigid (Consequences) Consequences that does not change rapidly with the choices that generate it. 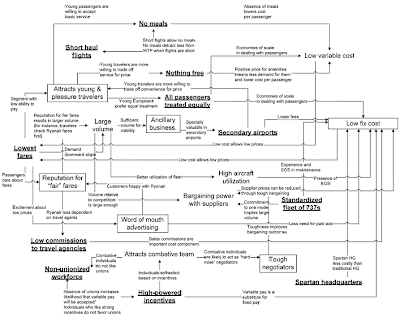 Casadesus-Masanell and Ricart uses a causal loop diagram, linking choices and consequences by arrows, to represent a business model. As one could make the effort of listing every choice made by management and all consequences of those choices Casadesus-Masanell and Ricart realizes the impracticality and reduces their business model framework to represent (i) choices (generally a subset of all choices), (ii) consequences (generally a subset of all consequences), and (iii) theories. The third element are suppositions on how choices and consequences are related, not a part of the business model, but theories of causality that are believed to be true by the business model designer or analyst. 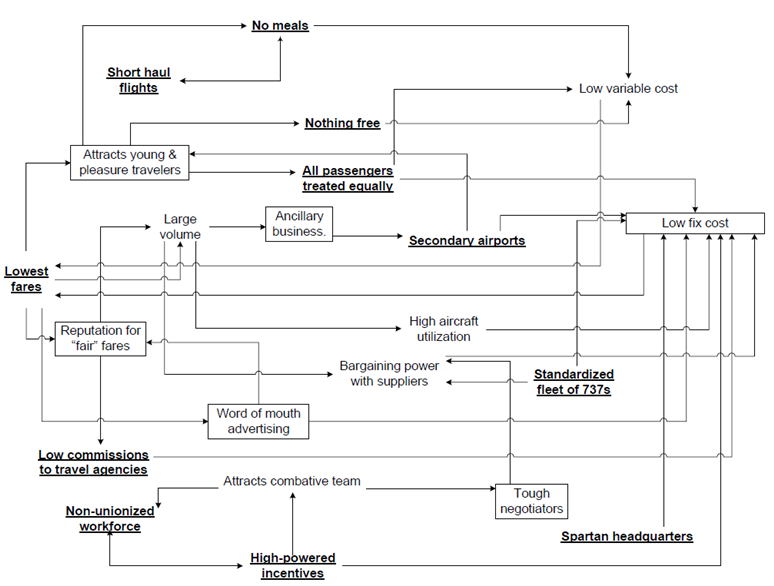 In the example below Casadesus-Masanell and Ricart illustrates the business model of Ryanair using bold and underlined to indicate choices, with rigid consequences in boxes, and flexible consequences in plain text. Casadesus-Masanell, R., & Ricart, J. E. (2007). Competing through Business Models. Working paper. Casadesus-Masanell, R., & Ricart, J. (2010). From Strategy to Business Models and onto Tactics. Long Range Planning . Seelos, C. (2010). 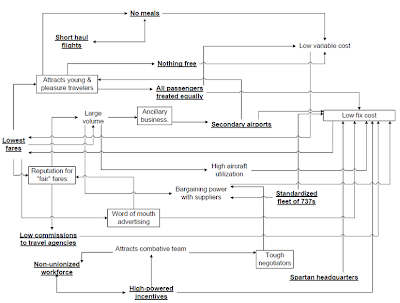 Theorizing and Strategizing with Models: Generative Models of Business Models. Working paper . Barcelona, Spain.